Description: Carapace yellow-brown to brown with head sometimes darker. Legs yellow-brown with dark annulations. 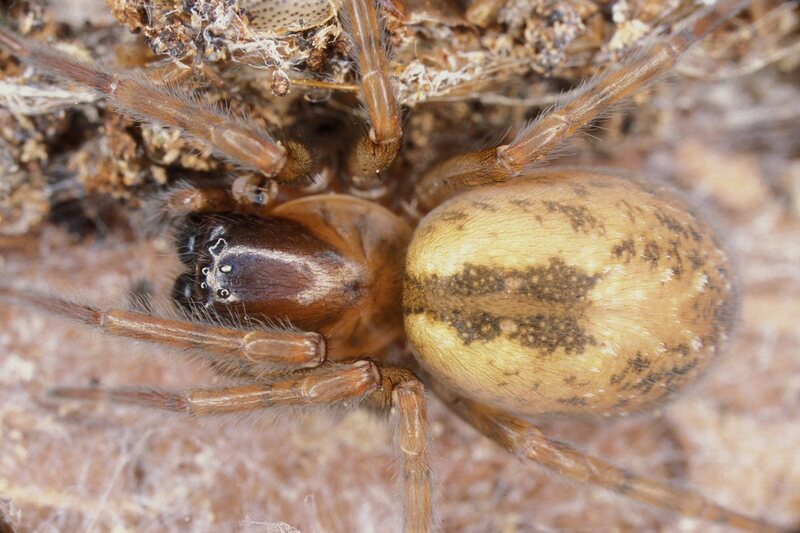 Abdomen yellow-brown with dark brown spots at sides. 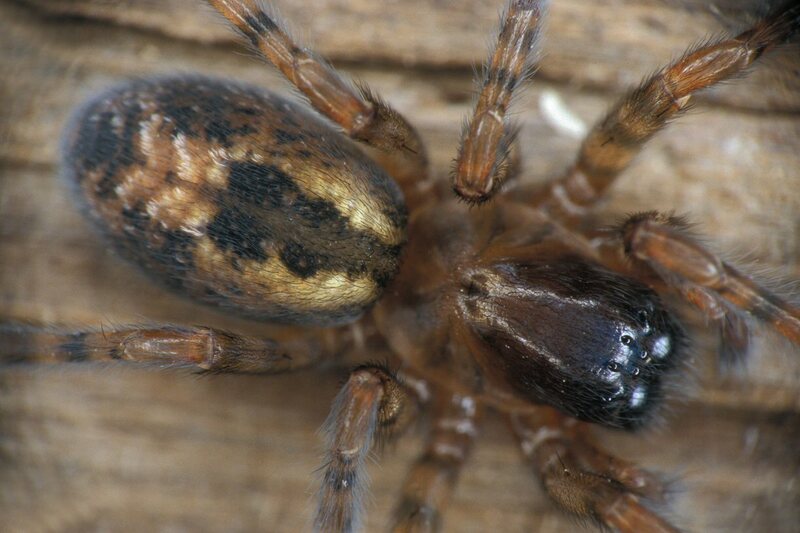 The area around the cardiac mark is darker than the remaining abdomen. Behind the cardiac mark there is a series of forward directed chevrons made by whitish hairs, further back followed by dark-brown chevrons. Size: Female 7-9 mm; male 5-7 mm. Genus: Amaurobius C. L. Koch, 1837. 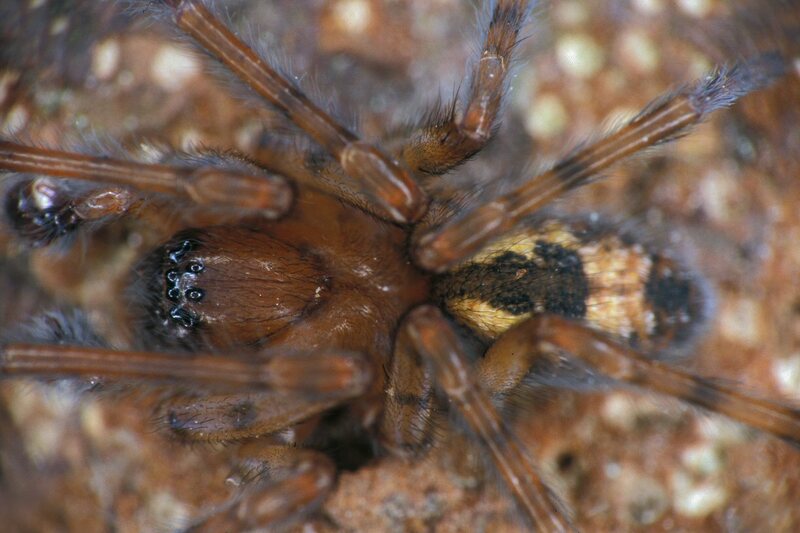 Characters of genus: Medium sized to large spiders with most species having a body lengtht between 3.5 and 15 mm (Roberts 1995, Kaston 1978). Head high, covered with bent black hairs. Clypeus a little higher than the diameter of one anterior medial eye. 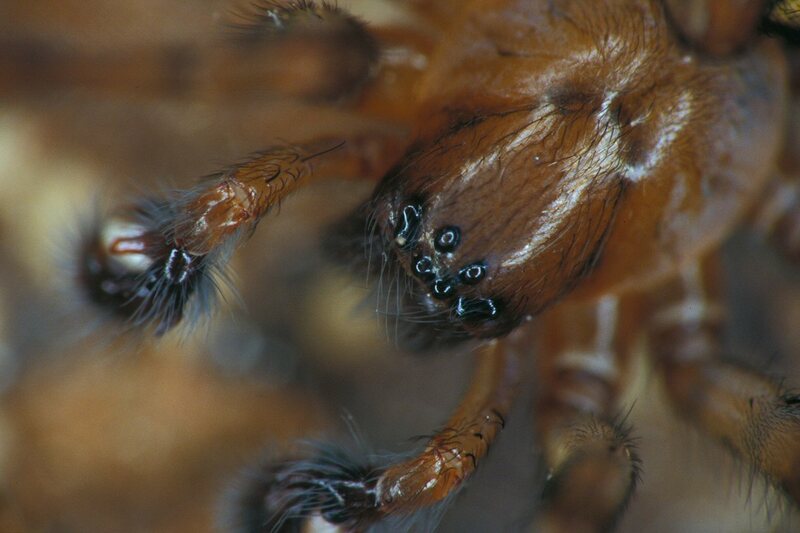 Chelicerae robust, bulging on anterior surface and with a prominent lateral condyle. A bipartite cribellum is present anterior to the spinners (divided in two by a fine ridge). Calamistrium with double row of bristles originating about 1/5 distance from base of metatarsus IV. Femora with well developed dorsal and dorsolateral spines. Trichobothria on metatarsi and tarsi increase in lenght towards distal ends. Males are slimmer than the females, but the abdominal pattern are the same in both sexes. Male with three tibial apophyses which usually are visible with a lens. Epigynes variable from large median plate with small lateral lobes to small median plate with large lateral lobes. 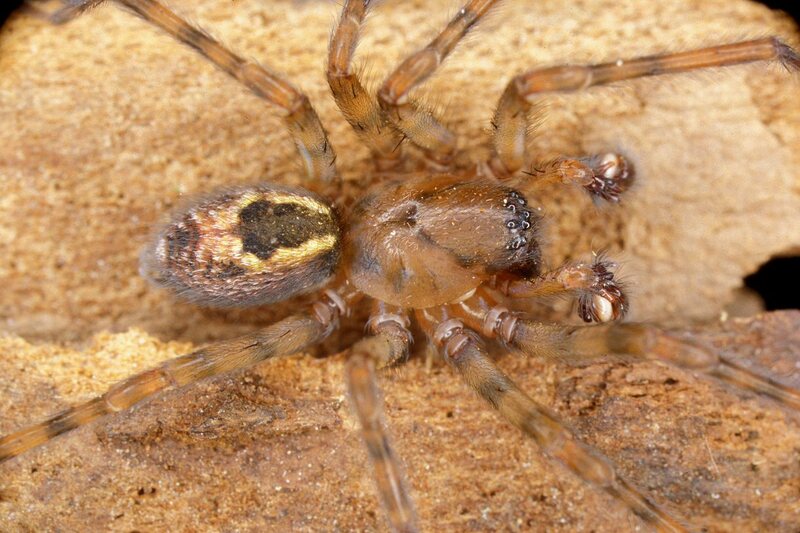 Family: Amaurobiidae Thorell, 1870 (Hackledmesh Weavers). Characters of family: Most amaurobiids are cribellate but some genera transferred to Amaurobiidae from other families are ecribellate, e.g. Coelotes as well as other genera of the Coelotinae subfamily. Amaurobiids possess three tarsal claws and are entelegyne. The 8 eyes are usually pale and arranged in 2 rows of 4. The carapace is longer than wide, often having a broad, only slightly elevated head region. A fairly distinct, longitudinal fovea is present in many species. The sternum is oval to shield-shaped and blunt apex at rear. The lateral edges of the sternum are often sinuous. 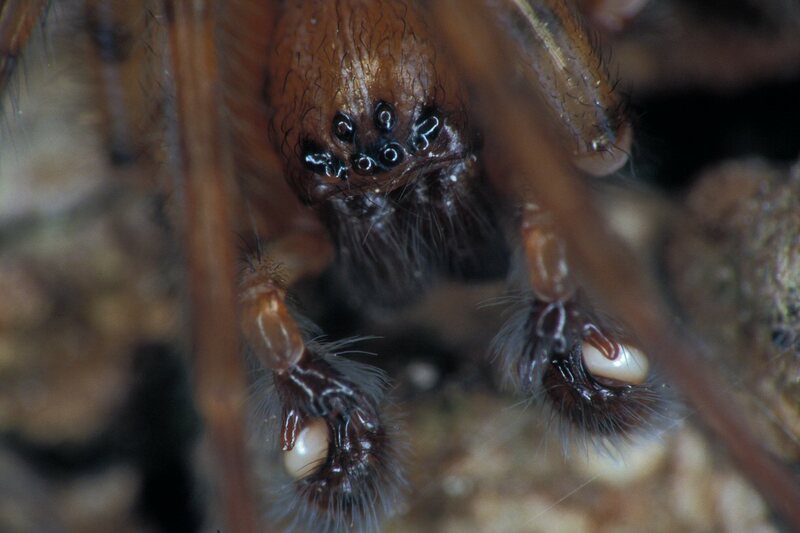 The chelicerae are often strong and usually longer and more slender in males than in females. The labium is formed like a rounded square or rectangle. The endites are almost parallel with brushes of hairs (scopulae) anteriorly. 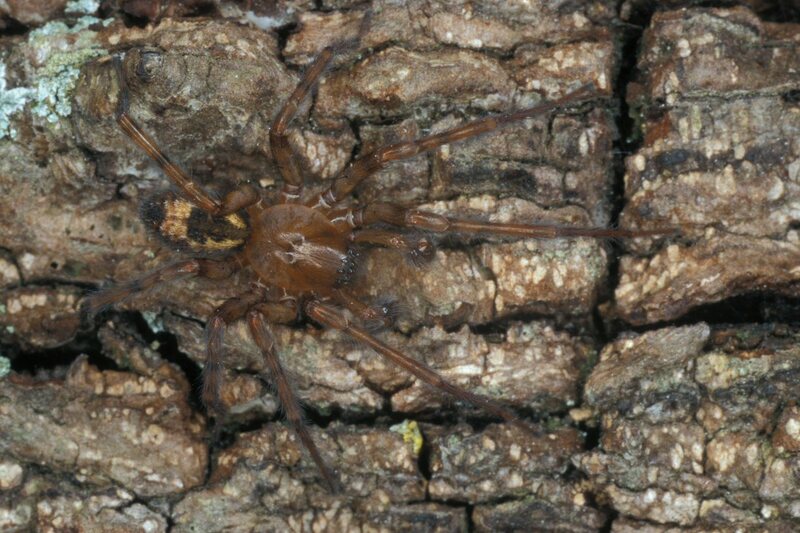 The abdomen is usually dominated by shades of brown or grey, often very dark and with markings as more or less distinct chevrons. It is densely covered by fine hairs of varying size. The legs are moderately long, especially in males and mostly uniformly coloured but sometimes with dark annulations. The tarsi and metatarsi are furnished with trichobothria arranged in rows, females with calamistrum on metatarsus IV having two rows of bristles. A more or less strongly divided cribellum is present anterior to the spinners. The cribellum is, however, reduced in males. The epigyne is often formed as a central plate separated from lateral parts by sutures. The male palp has simple sclerotized tibial apophyses and the shapes of these are important for species identification.